This impressive standing stone can be seen just a few yards from the minor road that winds through Glen Lonan, to the south of Taynuilt in Argyll. Also called Diarmid’s Pillar or Clach Diarmid, It’s smothered with lichen and appears very weather-worn, so it’s difficult to imagine how it looked in its original state. Described by various history sources as a Bronze Age monolith or menhir, the granite stone measures over 13 feet (4 metres) in height, and is said to mark the grave of an Irish hero called Diarmid or Diarmuid. Diarmid seems to have been an enigmatic figure in folklore, and any facts about him are hopelessly entwined with myth. He is reputed to have been a member of the Fianna, a legendary warrior band, and he fell in love with a princess called Grainne. But Grainne was promised in marriage to Fionn, the leader of the Fianna. The tale takes many forms, some ending in Diarmid’s untimely death during a boar hunt. 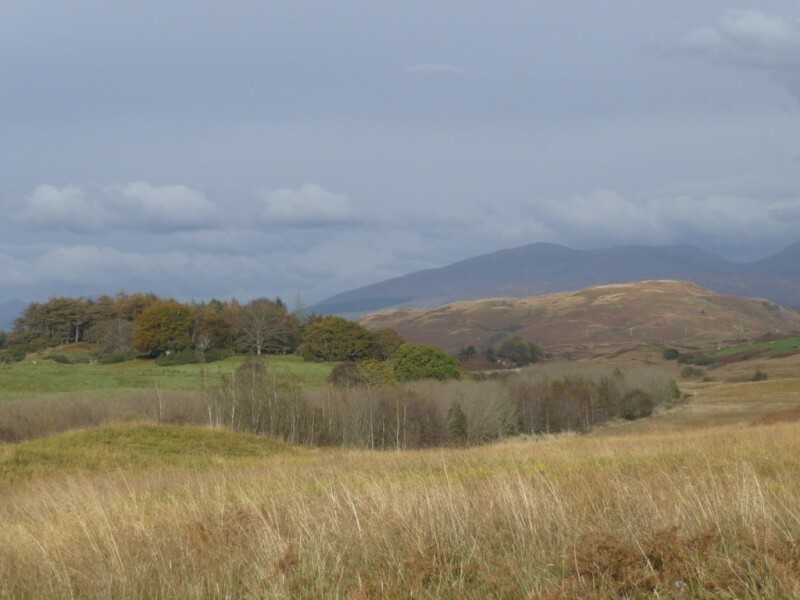 The Highland history website Am Baile describes Clach na Carraig as “one of the most impressive standing stones in Argyll”. Close by is a kerb grave or cairn, marked by 12 large stones, and to the north is a stone circle comprising 31 rounded boulders. 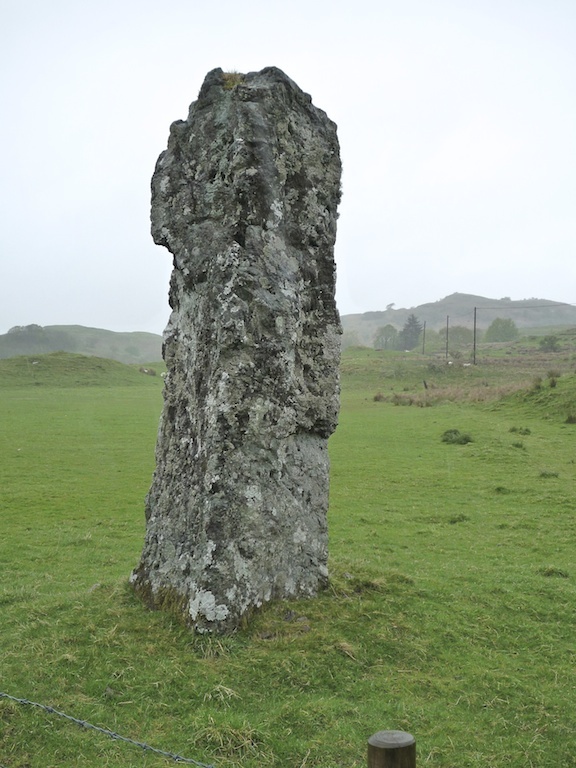 If you love standing stones, take a look at my feature on the alignment at Nether Largie in Kilmartin Glen, or the impressive standing stone at Kintraw above Loch Craignish. You can also read more about the ‘Road of the Kings‘ through Glen Lonan, an ancient pathway taken by funeral processions, leading eventually to Iona. Thank you! It’s an amazing stone, and it’s hidden away in the quietest, most beautiful glen. Thanks for signing up to my other blog, Jo’s Journal – I hope you enjoy it! Lichens are such interesing plants. Thanks for this special story. That story of Diarmid sounds familiar and I cannot figure out why. I always wonder how much of the mass of the stone itself is sunk in the ground to keep a monolith upright…as well as how much turf has accumulated alongside over the ages. (Of course, those fluffy, white standing stones will have kept things pretty cropped and trampled in more recent history, but still.) Fascinating, Jo! Yes, that’s very true, Hank – although sadly some stones elsewhere (including the stone circle at Fortingall which we visited recently) have been dug up by over-enthusiastic farmers in previous centuries, so we don’t really know how they were arranged. But I doubt anyone would be able to shift Diarmid’s Pillar! It is one of the biggest single stones I’ve ever seen. My guess is that at least another half of its length must be buried underground, if not more.